So we just did a crazy thing. We decided to buy a new house!! After 13 years of living in the same home, we started thinking about how we could expand my studio space – because thanks to all of you – I’ve outgrown my current situation. So my husband Jason and I sat down and started planning out whether to renovate our current home, rent out a separate office/studio space, or just buy a bigger home. This will be our new home very soon, if all goes according to plan. Being the former CPA that he is, Jason was able to crunch the numbers and realize it made more sense to find a bigger used home in great condition. The perfect place for us would ideally be not too far from our current home, since we love the area and we have established roots here. So we thought it would take a while to find exactly what we needed, and I was worried about the timing. Next year starts getting really busy for me in the spring and summer, which are usually the most popular times of the year to move. But low and behold, a few days after we started looking, we found the exact floor plan we were looking for at a price we could afford, and it’s ready for immediate move-in. The sleek modern cabinets, wide open spaces, and gorgeous kitchen really sold us on this house. Now to start making some cozy quilts to match….. So here’s where the timing gets super interesting. Although this particular home had been on the market for several months with no offers, once we quickly decided it was “the one,” it seemed as if everyone else wanted to buy it, too! The day we decided to put an offer on the house, we were notified that there were already two other offers and they weren’t accepting any more after the end of THAT day. Oh no… but this is OUR home we thought!! I love open floor plans with lots natural light. Decorating this space is going to be so much fun! As luck would have it, we were able to get a quick pre-approval from the bank, and thanks to the excellent (and quick) work of our realtor friend, we were able to make a strategic offer that was below the asking price, but still the highest offer on the table. If we had waited one extra day to decide… we would have lost out on it! Image from Ikea – not my home, though I wish!! I imagine this cheerful Ikea couch would look so fun in my new home. Or maybe one in teal, or navy, or seafoam…. it will be fun to decide! So now, we need to get ready to move! Of course there’s paperwork to finalize and there’s always the chance that something could fall through. But I’m an optimist and prefer to think about what could go right and the steps I need to take to make it happen. Here’s my friend’s dining room, who recently purchased the exact same home. I love the accent walls and want to achieve the same look, but with more of a modern vibe. Now the plan is to measure all of the rooms, budget out some improvements, and begin the moving process while still living in our current home. This will be my new sewing studio. The camera angle makes it look long and skinny, but it’s more of a square. I imagine built-in cabinets along the left wall, my sewing table under the window, and a humongous design wall along the right wall (which needs to be repainted first). And here’s another fortunate miracle of timing: after being busy with deadlines, projects and travel non-stop for the last 4 years, I actually have a bit of a breather over the next few months. My next book deadline isn’t until later next year, I don’t have any sewing deadlines until fabric samples arrive in the spring, and my next teaching event isn’t until QuiltCon in February. So rather than sewing in December and January, I’ll be “piecing” together my new creative space! This is the view from the opposite end of the sewing room. The corner nook would be perfect for more built in shelving, with a cozy chair for hand-work or reading. The guest room is nearby with a large walk-in closet for extra storage and my husband gets a larger office, too. I’m excited to document this process in real time, and hope you’ll indulge me as I focus a little bit more on home-making and a little bit less on quilt-making. But don’t worry, I’m still planning to host our next quilt along in January, but with a slightly later start date. Fortunately the quilt along steps have already been sewn and photographed, so you all can sew-along, while I’m setting up my new workspace. I’ll approach this new venture like any other large project: one step at a time! The backyard isn’t very big since the house footprint takes up most of the land. But I love the low- maintenance landscaping, and there’s still plenty of room to spray baste my quilts. Stay tuned for the next part of my new-home adventure. I can’t wait for the journey! This week I’m having a fun beach vacation with the family and since I’m not sewing, I’ve had a bit of time to think about sewing instead. Recently it occurred to me that whenever I travel and teach, I often say that I do all of my own “stunt sewing” – and I know I’m somewhat of an anomaly when it comes to professional quilters that do this full-time. There’s nothing wrong with busy designers getting help, but I just love sewing my own stuff and don’t want to give it up! View from my “office” this week at Hermosa Beach, CA where I’m writing this blog post. Recently, someone asked me “now that you are successful in your business – when are you going to hire me to sew for you?” I know she meant it as a compliment and really wanted to help me out, but my gut reaction was – if I ever get to the point that I don’t have time to sew or quilt my own quilts, what’s the point of HAVING a quilting business?? For reals, I’d rather hire out my cooking and cleaning than ever give up sewing. In fact, I already have a team in place that helps me with some of the other tasks – a graphic designer helps lay out my patterns, and I just recently started using the services of a virtual assistant to help me with some of my pattern editing. We’re starting off each beach day with a family bike ride; we love great views and great exercise! From time to time, I’ll enlist other designer friends to make quilts to showcase my fabrics using their patterns, and sometimes enthusiastic fans and followers will pitch in and remake some of my older patterns using my fabric. In all of those cases though, they are making THEIR quilts, not MY quilts. In fact, it was kind of funny that when I was working on creating the projects for my second book The Ultimate Guide to Machine Quilting, the deadlines were VERY tight. I had to make about 10 quilts in 4 months so my publisher offered to pitch in and help. Because the book focused on machine quilting, they offered to help with piecing or binding to help reduce my load. I looked at them like I thought they were crazy pants and politely turned them down. I’m not sure if it’s my control freak tendencies or what, but the fact of the matter is, I simply like to do each step of the process myself, LOL!! One of the guest beds at the beach house is our “flat” staging area waiting for photography. FYI – Dot’n Dash will be the quilt-along I’m doing next month– so stay tuned!! Now that I’m designing fabric, I have even less time to sew because much of my time is spent with a sketchbook or at the computer. But all that really means is instead of mass producing large quantities of new quilts and patterns, I’ll be very thoughtful about the quilts I choose to make, and I’ll continue to enjoy every step! The other thing it means is that I can take more time to tell you about the quilts I am making, and share more than just one picture or blog post of each. Speaking about being more thoughtful about how I share my finished quilts, Jason had the brilliant idea of bringing a few of them with us so we could photograph them in cool beachy locations on vacation. I loved that idea, especially since there wasn’t much time for photography before quilt market. So be on the lookout my official “Ta-Da” blog posts a little later on. I usually like to have a landing spot for the finished quilts I make which includes all of the pertinent details: size, materials used, quilt designs I chose, etc. I also enjoy writing up a little more about the process of making them so at least I can get a little more mileage out of each quilt, since there are fewer quilts to share. For some people, their quilt isn’t finished until it has a label. For me it’s not done until I’ve blogged about it. This is an “outtake” of our photo session showing my son’s feet, who’s our official quilt holder. He’s pretty good about hiding all of his body parts while we shoot, LOL!! Kits for this quilt are available here. While we are having a great time at the beach, (after a super busy spring and summer of teaching), you can be sure I’m also planning out the next round of quilts and patterns I’ll be working on later this year – and how I’ll be able to finish step of the process in a limited amount of time. After two rounds of fabric design (and working on my third!! ), I think I finally have a handle on what a realistic timeline looks like, and feeling happy that I’m not biting off more than I can chew! Now I’m curious – which parts of the quilting process do you enjoy most? Do you like to just piece, quilt, or do the whole shebang like me? Remember – it’s your quilt so there’s no wrong answer!! I just returned from a fun, but busy two weeks away from home – one week teaching in North Carolina, and the following week on a family vacation to the Riveria Maya in Mexico (near Cancun). I’m interspersing some pictures of our family vacation with my thoughts about blogging so you have something interesting to look at while you read. We also visited two other eco-parks: Xplore and Xel-ha and they were all amazing! While I was away on vacation, I had one of those moments of clarity that only happens when I’m away from my machine or relaxing and doing something else. Last year I wrote a post about my need to simplify social media. I followed it up a few weeks later with another post about what it was like a few weeks in. Now that a significant time has passed I realized what channel I enjoy the most – blogging!! I enjoy being able to go in depth about thoughts I have, and being able to share multiple pictures to tell a more complete story. I still share in-the-moment experiences and projects on Instagram and Facebook (find me on IG @christaquilts and my FB group ChristaQuilts) but I love being able to think about and express longer-form thoughts here on the blog. In fact what I usually like to do is gather the pictures and snippets I’ve shared on IG or FB over a period of days or weeks, and then turn that into a more complete story here on the blog. Our family motto is work hard – play hard! We work a LOT so we can enjoy fun family vacations on a flexible schedule. Near the end of our trip it got very rainy and windy but that didn’t stop us from having a great time! The waters are warm and the views are spectacular! For me, the blog is more of a way for to document my quilting life (and occasional personal life) in real time. Of course I’ll still blog about new product announcements, workshops I’m teaching and quilting events I’m attending because after all, quilting is my full-time job and marketing is a huge part of that. But my favorite posts to write are process posts, sharing tips and techniques along the way while I’m creating. I also enjoy penning the occasional thought-provoking soapbox post, too! You’ll also notice I don’t do as many giveaways either. Although they are always fun and generate lots of traffic, it’s really too much to keep up with the flood of comments. I much prefer the thoughtful interactions we can have when you all leave comments or email me directly on a post of substance. I do try to respond to each comment personally (which you won’t always see in the comments section unless it’s something that everyone else needs to read, too). Because I’m one of those people who tends to think out loud, blogging also helps me process things and get them out of my system. So it really IS true that quilting, or even writing about quilting is great therapy!! Since I recommitted to the blog at the end of last year, I’ve found that it’s easier to do consistently the more often I try. I fell in love with Sea Turtles on our vacation – the babies (above) have the most beautiful patterns on their shell! I’d never seen a full grown one (below) in real life until now – they get huge!! It’s hard to tell the scale of this turtle but this one is at least 10x bigger than the baby. There was an even larger one but I missed getting a pic – trust me – they are huge!!! When writing my blog, it takes me a long time to finalize each post, adding links and images where necessary and double, triple, quadruple checking for typos each time! But I heard once that if you “create before you consume” you feel a whole lot more productive. That seems to work for me as I usually try to start a blog post in the morning as part of my routine before I get into the flow of my workday. It usually takes me a couple of days to knock out a blog post – so once I quit worrying about trying to blog daily and settled on 2-3 posts per week, I felt that’s something I can easily manage. That means if you see a week where I’ve only managed to write once, you’ll know there’s something big happening behind the scenes, or I’m just way behind on my work, LOL!! I did manage to get in a bit of exercise while on vacation. Our resort had lots of winding pathways that were perfect for jogging through the lush jungle. We saw all kinds of critters, too: iguanas, monkeys, coati and even racoons!! But alas, they were all too fast for my camara! I try to keep a running list of topics I want to write about and will keep an editorial calendar so that I can be thinking about what I want to convey before I sit down to write. By keeping a running list, I can also pick and choose what I feel like writing at any given time. For example, I’m writing this one just as I returned from vacation, but wrote two more “evergreen” posts ahead of time while I was on vacation. They were faster and easier to crank out in in small snippets of time. Because I’ll have lots of catch up sewing to do when I get back, knowing I have a couple of posts in the queue waiting to go lets me relax and start writing more without feeling like it has to be done RIGHT NOW!! Blogging is actually very similar to how I design and quit: I’ll think about something for awhile, block out time to work on a project, and then settle in for the actual work time without distractions. Also, when I’m not trying to cram something in last minute – either blogging or quilting – I can be more relaxed about it and enjoy the process more. Another thrilling part of our adventure was zip-lining through the jungle – most times it ended in water which was refreshing after a fun, heart-thumping ride! Every now and then I hear about people lamenting the downfall of blogging and others questioning whether or not blogging is still relevant when there are so many other choices. Just like with anything else in life, writing a blog or even reading a blog isn’t for everyone, and that’s ok, too! Ironically what I’ve found is that be because fewer people are blogging these days it actually allows my blog to be seen more, unlike the “blogging boom” of a few years ago when everyone was doing it. Because there’s not such a drive for me to monetize the blog – or stress about whether my “SEO” is “MIA” – I can can focus more on being a quilter who blogs, not a blogger who quilts. Proof that we’re not working ALL THE TIME though sometimes it might seem like it! And with that said, now it’s time for me to unpack, do some laundry, and start thinking about the next quilt. It was a fabulous vacation, but now I’m excited to be home and I’m ready to get back to my sewing machine!! So it dawned on me the other day that sharing is an integral part of my process. I’ve been feeling a bit lost over the last year because although it’s been a whirlwind of activity – pattern writing, fabric designing, traveling & teaching, workshop filming – I haven’t taken as much time to properly document and share what I was doing. So I hope you’ll indulge me while I write a bit of an essay on this subject. I’m weaving in some “behind the scenes” photos of my latest Craftsy shoot so this isn’t just a wall of text!! I’m pretty good at sharing real-time snippets on facebook and instagram, but I really, really, miss writing actual long-form paragraphs about what I’m doing. I’ve forgotten how much I enjoy that part of things!! Throw in a whole bunch of “secret” sewing and I’ve felt like I’m doing a whole lot but not actually getting anywhere with it, LOL!! So I hope to change that up for the rest of this year. I’ll still be as busy as ever – I like it that way and it keeps me out of trouble. But as much as I can, I want to share more of the process with you. I was actually looking through my contracts for a bunch of stuff I’m currently working on and you know what? They don’t actually say I can’t share!! Going forward, I’d like to combat one of those “quilting myths” – that as a designer, you have to keep everything secret until it’s ready for the marketplace, or else everyone will get tired of seeing it and won’t want to buy it when it’s time to sell. Just remember – the reality is that full-time designers like me have to sell what we produce, or we are out of a job, LOL!! Well you know what? I’m willing to take that risk!! I hope you won’t get bored for example, if I actually document and share the process of making my next round of quilts for my next fabric line. Or share some behind the scenes pics of my latest Craftsy filming, even though the class won’t be available for a couple more months. Checking out what it looks like from my producer, Evan’s point of view. Notice the clock on the wall says 6:35 PM. We started each day at 8:30 am. It take 3 full days to produce about 1 1/2 to 2 hours of content. Those were some long – but fun – hours!! Although my latest projects won’t be available for mass consumption until at least this summer, how can I enjoy the next few months of sewing if I can’t even show you what I’m making?? Trust me, after writing 3 books, filming multiple Craftsy classes and now finalizing my latest fabric line, it’s killed me that I haven’t shared these things in “real” time. Not to mention all of the fantastic teaching trips I’ve been going on and fabulous people I’ve been meeting when I travel. I’m really feeling compelled to share more as a way to process my experiences. Although I’m the only one you’ll see on camera, it takes a dedicated team to produce such high-quality Craftsy videos. Jim (left) and Tommy (right) were top-notch camera guys!! Sure, writing up a post about the finished quilt/class project months later is still fun, but I’ve somehow missed the magic that I like to capture in the moment when I document things in real time. I know part of the problem is that I got caught up in the social media rat race that I wrote about at the end of last year. My reduced social media presence since then has been great (see my follow-up post here). But I think I’m ready to now strike the balance of doing a tad bit less production work, and in the process sharing more of what I do in-depth and in real-time here on the blog. I guess you could say I’m aiming for less quantity, and more quality both in my making and my writing. My Craftsy editor, Linda has worked with me on all of my Craftsy classes. She’s become more than I colleague. I now count her as a dear friend, always willing to help me do my best!! So be on the lookout for more process and adventure posts from me. Darn it, I haven’t even had time to write about my trip to QuiltCon yet this year, and just like the first time I went in 2013, it inspired me in ways that will impact my making for years to come. So – more on that soon – I promise!! Until then, happy quilting, making, sharing, and processing!!! I’m back with a quick update to let you know how it’s going. Now, just to reiterate, I’m not giving it all up, obviously since I’m still writing on my blog. But I did give up a lot. I paired my social media presence down to 3 places: the blog, instagram, and my facebook group. That’s still a lot for some, but it’s less than half the social media venues I used to keep up with. In a word – it’s fabulous! Here are pretty pictures of fabric I’m currently working with so it’s not all just words! At first I was having withdrawals, which quickly subsided after I finally allowed myself more time to contemplate and think. I was in several business Facebook groups that I had joined for networking purposes. It was a little hard to give them up in the beginning because I missed the daily interactions. However, by getting in to the habit of checking them every day, multiple times a day, it pulled me into a constant timesuck because I didn’t have the fortitude to get in and get out. Now that I only have one place to go on Facebook, it’s a quick check in the morning, a couple pop-ins throughout the day to reply to comments, and I can focus on GETTING THINGS DONE! I love organizing these fat quarters from light to dark to see how they sparkle. I also have so much less FOMO (Fear of Missing Out)!! When I don’t know what I don’t know, it’s so liberating to not constantly be comparing myself to what others are doing. I was worried that I’d miss out on opportunities to do great things, by not being “out there” as much, but let me tell you – the work has NOT slowed down. I’m currently working on my 4th book proposal, my 3rd Craftsy class and my 2nd fabric line, not to mention preparing for a slew of in-person workshops. Now it’s kinda nice when I get an email from someone wanting to collaborate on something. Yes, email is still a great way to communicate! For me, it’s so much more effective than trying to keep up with direct messages on Instagram or Facebook that I sometimes don’t even know are there! I’m also not on a strict time schedule on my blog. Sometimes I’ll blog three times a week, sometimes just once and it feels great to have that flexibility. By not being constantly sucked into social media, I have a more realistic time frame for how long it takes me to actually make a quilt. I think the constant barrage of New!New!New! on social media can give us unrealistic expectations of how much we need to accomplish or how fast we need to get it done. I prefer a slow and steady pace so that I can enjoy each step of the process, and by stepping back I’ve been able to enjoy more making without feeling like I have to crank out a new project or tutorial each week. I’m definitely a person who prefers quality over quantity. And now, so as not to spend all day writing this post, I’ll sign off with huge hugs to you, my readers who make this all possible. By continuing to support me, you allow me to pursue my passion full time and I can’t thank you enough!! Now I’m off to continue working on the project I shared a few sneak peeks of above. More about that in a couple of months…. My buddy and co-author Angela Walters came to visit my local guild in January, so she got to see me sporting my fashionable elbow sling! Thank goodness I love to wear black and white, LOL!! Click here to see the book we wrote together in 2016. The year didn’t start off so great. After trying to get healthy and fit, I dislocated my left elbow when I fell from a climbing wall at the gym. This is an activity where you free-climb indoors without ropes and there’s padding on the floors to catch your fall. I was great at climbing, but not so great at falling. I’ve now learned that when you fall, it’s best to tuck and roll and NOT reach your arm out to break the fall!! It’s taken the majority of the year for me recover and heal completely, but I’ve been working on a safer workout routine, and next year is shaping up to be the year I finally recover my fitness. Here’s to a healthy 2018! February – Lots of Teaching! Student work from one of my classes at QuiltCon. Click here to read my blog post about QuiltCon 2017. March – Lots of Ribbons! Churn Dash Slide – 1st place single entrant category at DQN Quilt Las Vegas 2017. Click here to read more about my local guild’s quilt show in 2017 and a new milestone. April – Lots of Patterns! Click here to see my full collection of printed quilt patterns. Click here to see my full collection of PDF quilt patterns. Here’s to another 24 years of love and marriage! This was us at the beach a couple of anniversaries ago and it’s still my favorite place to hang out!! Click here to read more about my judging experience at the show. I judged my very first quilt show! I was brought into the Vermont Quilt Festival to add my modern voice to the talented pool of judges they solicit each year. It was amazing to get up close and personal with each and every quilt and see the detail and love stitched into each one. I was on my feet for 6 days straight – 2 days of judging and then another 4 days teaching, so I don’t know that I would be keen to combine both types of work in the future, but It was a fabulous experience nonetheless. I launched my second online Craftsy class, Startup Library – Quilting. This workshop is 3 times longer than my first class and was created as a basic introductory course for brand new quilters, or those who’d like to freshen up their quilting education. Working with the folks at Craftsy is such a treat, and they are so professional! They produce top notch videos and I plan to continue to work with them to launch additional classes in the future. Click here to get your signed copy of Piece and Quilt with Precuts. I released my third book, Piece and Quilt with Precuts. Just like my previous two books, it includes start to finish instruction for making the quilt top, plus strategies and step by step diagrams on how to quilt them. After writing 3 books in a row non-stop, I’m taking a little breather to catch my breath before starting on the next one! Setting up for my class at the fall MQX quilt show. Click here for info about next year’s shows – spring and fall. I taught at MQX quilt show for the first time (and will be returning again in the spring of 2019). This show is special to me because it’s the first national quilt show where I received a ribbon. Back in 2013 I entered my String of Pearls quilt in their newly created “Quilting the Modern Way” category. I received an honorable mention but to me it felt like best in show! Click here to get a fat quarter bundle of Modern Marks, while supplies last. I launched my first line of fabric, Modern Marks at international quilt market in Houston Texas. Fabric design has long been a dream of mine and it was so gratifying to achieve this goal. So far it has been well received and my hope is to continue designing 1-2 fabric collections a year for as long as it is sustainable. We get silly with the extended family at holiday time each year. My MIL creates an elaborate scavenger hunt and we all dress up based on a movie theme for the year. This year’s theme was “Day of the Dead” from the Disney movie Coco. We’re celebrating the fact that we’ll be headed to a fun family reunion in the Mexican Riviera next year and we can’t wait! I spent a lot of time enjoying time with my family. 2018 will be a big transition year for us – the oldest heads off to college and the next oldest graduates from high school. The youngest who has been home-schooled the past 6 years wants to go to regular high school (for her sophomore year) to see what that is all about. We may actually have some time in 2018 where it’s just the two of us at home during the day – I can’t even imagine what that will look like, or how quiet it will be, LOL!! I love connecting with others face to face in class and at fun events. Click here to read my post on simplifying social media. I traveled to my last teaching event of the year at my friend Stephanie’s shop, Quilt Addicts Anonymous. It was a crazy busy, but fun year of teaching! I did a total of 17 multi-day teaching events in 2017 and realized that as much as I love it, that’s a bit too much. I’ve decided to slightly scale back and limit my travels to no more than 1 event per month, and I’m still booked solid for the next two years. I also decided to simplify my social media to focus on more quality and less quantity. Although it’s only been a few weeks since I made the switch, I’m already enjoying more time and head space for me to truly do what I love – create! I hope you had a fabulous 2017 and are looking forward to more quilty fun in 2018!! Today I’m pleased to be a part of the blog tour for the brand new book published by The Modern Quilt Guild and C&T Publishing, Modern Quilts: Designs of the New Century. It’s a beautiful coffee table book presented in hard cover with images of over 200 modern quilts. Click here to pick up your copy of Modern Quilts: Designs of the New Century. I always like to give a little behind the scenes backstory about how I end up being featured in collaborations such as this one. Sometimes it’s luck, other times it’s tenacity, and most of the time, it’s a bit of both! When I attended the first QuiltCon in 2013, I knew right away that the time had finally come to start getting published and raise my professional quilting profile. One of the lectures I attended was on publishing a book, given by the editor of C&T, with panelists such as Angela Walters, among others. I came home from the show on fire and ready to get to work! Although I ultimately went with a different publisher for my own books, I’ve always been impressed with the quality of books published by C&T (and will be a small part of another book of theirs coming up in 2018 – so stay tuned). An early “profile” image of me with Modern X back in 2014. As soon as I could, I starting participating in Modern Quilt Guild events, submitting quilts to their shows each year, teaching at QuiltCon, giving webinars, and being one of their designers of the month (back in 2014-the first year they launched that program.) In other words, I got involved!! When the MQG had a call for entries for this book, I eagerly applied. They looked through images of all the quilts that were submitted along with entries into all previous QuiltCons and I was pleased to end up with two quilts in the book! Check out #modernxquilt on instagram to see many amazing versions of this quilt! Click here to get the PDF version of Modern X quilt pattern. Click here to get the print version of Modern X quilt pattern. Modern X was featured as one of the quilt patterns of the month created by and for MQG members. Here’s a fun fact: It was my suggestion that the MQG feature the quilts of the month as a special exhibit at QuiltCon which they’ve done every year since 2015! The original HST quilt. My photography isn’t great since this was taken before we got good equipment. However the photos in the book are top notch! 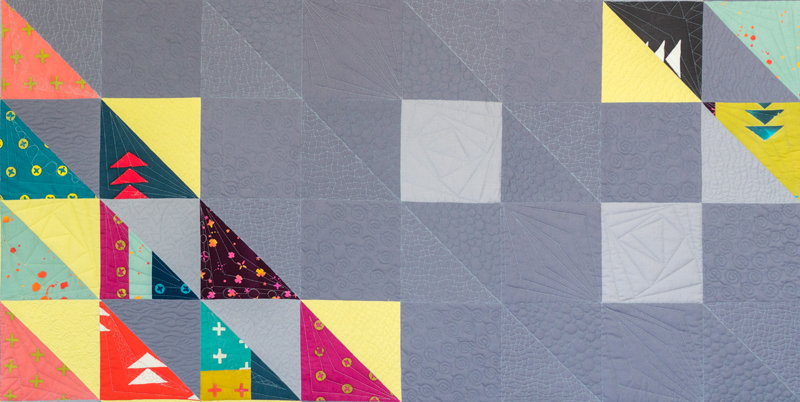 HST (Half -Square Triangle) was originally patterned way back in issue 5 of Make Modern Magazine. When I originally made the quilt in 2015 I knew I had created a special design and wanted to enter it into QuiltCon for 2016. However, when I went to wash the quilt, I used a “gentle” wash powder that ended up bleaching parts of the quilt! Needless to say I was devastated. Since I’m always one to try and turn lemons into lemonade, I was pleased when this quilt was still able to be selected for the book. With some clever photoshop editing, you can’t see the bleach stains in the book photography and I’m glad it was able to be included. Since I love making functional quilts, I still use the quilt every day and it’s nice and warm because I used super thick cotton batting. I quilted HST with a lot of straight line quilting, and I created a woven texture in the background by alternating the direction of the lines. I threw in a few random spirals in the lighter gray blocks. HST Backing – I love making pieced backs from leftovers! The only thing I wasn’t happy about HST (besides the bleach stains) is that doesn’t hang well because I used a woven textured background fabric. Because of the looser weave, the background ended up stretching too much as I quilted it. So even thought it was painful to accidentally “ruin” a quilt, I decided that if I remade the quilt, I’d be able to create an even better version and try out some different quilting ideas. I was pleased to sneak in a little of my Modern Marks fabric for the binding! And now there’s another happy ending to this story. Because I loved this design so much, I knew I had to remake it and submit it for QuiltCon 2018. I almost cried when I received my acceptance that it made it into the show! The background of the HST remix is all pieced from regular cotton solids so they were nice and stable and didn’t stretch. In both versions, the negative space is made from individually pieced background squares to add a bit more dimension rather than using large chunks of fabric. There are some slight differences from the first version. Because I ran out of fabric, I had to do some improv piecing to get enough triangles. I also decided to make them slightly bigger so that it would fit my bed. I also kept the idea of random pops of yellow and lighter gray but tried not to duplicate the layout exactly. A draft “quilting plan” for HST remix. I obviously went in a different direction, but kept some of the elements in my final version. It often takes me many tries until I get a design I like. Although this takes time, it saves me hours of time ripping out a quilted design that looks great in my head, but doesn’t actually work on the quilt! Another quilting plan in progress – it’s getting closer to what I actually did! Click the image above to see closeup details. I think my favorite part of the quilting was quilting some irregular chevron designs in each of the HST blocks and adding a bit of “embellishment” by randomly quilting a different free-motion design in a few of the blocks. I gave a nod to the original HST with a touch of straight line quilting and modern spirals. Overall, I’m happy with how it turned out and I’m pleased that the original HST is preserved in the book, and folks will get to see HST remix “in the cloth” at QuiltCon next year! I loved using Alison Glass handcrafted batiks for this quilt! Click here for a list of all the stops on the Modern Quilts blog hop, and to see more of the beautiful quilts in the book! There are no patterns in the book, just hundreds of pages of beautiful modern quilts for you to explore. I highly recommend this volume for anyone interested in modern quilts! It’s that time of year again, where you can find an inspiring virtual quilt show on Instagram. Just search the hashtags #quiltconreject and #quiltcon2018 to see many of the quilts that were entered into next year’s show (happening in Pasadena, CA Feb 22-25, 2018). I’m pleased that HST Remix shown above was accepted into QuiltCon 2018. I’ll be blogging more about this quilt and the other one that made it in, so stay tuned! QuiltCon has been happening since 2013 and as social media has grown, so has the sharing which is nothing short of inspiring. In the early days of QuiltCon, feelings were a little more raw when many who had entered a show for the very first time ever, felt that their quilts not getting in was somehow a rejection of themselves, rather than a simple fact of math. About 1400 quilts are usually entered each year and there’s room to display only about 350 of them. So that means quilt entrants only have about a 1 in 4 chance of getting in. Or in other words, 75% of the quilts that are submitted won’t make it in. Detail of HST Remix. For each quilt show entry you usually provide two images – an overall view of the entire quilt plus a closeup so they can see the machine quilting. What I’ve noticed this year is a much more upbeat attitude: sure quilters are still disappointed when their beautiful work doesn’t make the cut. But when they look at the sheer volume and amazing workmanship of others that also were “rejected”, they seem to take it in stride. I’ve certainly known my fair of disappointment and rejection. I’ve entered quilts into QuiltCon every year from the beginning and each year my non-acceptences or “rejects” have far outnumbered those that were juried in. Colorweave is the second quilt that was accepted into QuiltCon. It’s simple yet graphic. I have managed to have at least one quilt in each QuiltCon (see them here: 2013, 2015, 2015, 2015, 2016, 2017, but some of it was pure luck: for the first QuiltCon back in 2013, no one really knew about it until the entry deadline had passed, so the odds of getting in back then were MUCH higher. Then in two of the previous shows, the only reason I got in was because of “automatic” triggers: I had a quilt in the 2017 issue of QuiltCon magazine which was a guaranteed entry, and in 2016 one of my quilts was in the MQG showcase which was also an automatic entry for that year. And you know what? I’ve never won a ribbon at QuiltCon before. I certainly don’t enter to win – the joy for me is in the sharing. But it is kind of ironic, that I’ve been able to get a ribbon at many of the national quilts show I’ve entered, but none at QuiltCon. There’s no bitterness at all there, just a simple acknowledgement that QuiltCon is unlike any other show out there, which is one of the things I love about the show. Heck, some of the quilts that have won ribbons at other national shows never even made it into QuiltCon, which just goes to show that just because a quilt didn’t get in, doesn’t make it less amazing or not worthy. If you are one of those feeling a little bruised because your quilt didn’t make it into QuiltCon (or another show for that matter), might I offer this bit of encouragement: you are doing your best work right now and it will only get better! If you are new to the quilt show circuit then I recommend you start with a local or regional show first. Usually they aren’t “juried” shows which means they’ll accept quilts on a first-come first basis until the slots fill up. This is a great way to see how it all works – filling out an application, getting your quilt to and from the venue, what it feels like to read judges’ comments, etc. “Rejection #2” – Spools. Both this quilt and SWAK above are from my book Piece and Quilt with Precuts which just goes to show a quilt can still be publication worthy and not get into a show. Then, once you’ve got your “big-quilter” britches on, go for the national shows. They all have a different aesthetic, different jurors, and different judges. Quilt show entering and judging is EXTREMELY subjective, so as long as you know that going in, you’ll be okay. The back of Reject #3 which I can’t reveal yet because it’s slated to be published in a magazine next year. Even though it wasn’t juried into QuiltCon, it will be displayed in the publisher’s booth. Here’s just a small list of shows that I enter regularly with links to their websites. I only enter shows with modern categories, so that limits things a bit, but know that there are a whole slew of shows out there and if you google “quilt show entry” you’ll find a wealth of information. If there’s a show you particularly like that’s not listed below – please leave details in the comments for others to see. Now, let’s go make some more fabulous quilts, whether they are included in a quilt show or not!! Christa’s Soapbox – Do I Sleep? The Answer is Yes! Today I thought it would be fun to answer the often asked question, how do I get so much done? Or put another way – do I sleep? The answer is a resounding yes! In fact, I’m NOT a night owl and if I don’t get at least 7-8 hours per night, it reduces my productivity big time. Getting things done: we recently photographed some of my quilts so I can write more in-depth blog posts later. I think about the shots I want, Jason edits them to make them look pretty! One thing to keep in mind is that quilting and running a business is mine and my husband’s full time job. Plus we have help. It’s taken me awhile to figure out what I do best in our little mom + pop operation: what I need to do myself, and what I’m willing to give up control over. And it’s different for each type of creative person. For example, when it comes to quilting, I do all my own “stunts.” I design, piece and quilt all of the quilts I make for books, patterns and classes because that’s the most fun part! But I hire out much of the technical stuff to make it all look good. Behind the scenes: quilting a quilt that will be featured in a magazine next spring. All of the “big” projects I produce is done in partnership with quilting industry companies such as Benartex (my fabric), Craftsy (my online videos), Martingale (my quilting books), and Aurifil (my thread.) This allows me to design and create while tapping into their professional expertise in layout, editing, photography, video production, and marketing. The only thing I self-publish is my stand-alone patterns, which is probably why I don’t release more of them on a regular basis, LOL!! I have found that I work really well with deadlines, as long as they are imposed on me by others. It’s much harder for me to set my own internal deadlines!! More “secret sewing” – this one debuts in a book collaboration next year – I can’t wait! A typical work day for me consists of getting up early and getting right to work. I try to do all of my social media (blog, instagram and facebook) first thing, so that I’m not constantly distracted by it throughout the day. (That doesn’t always happen of course, which is why I recently decided to streamline and simplify my social media.) Then I jump into whatever project I need to work on for the day – designing a new pattern, working on a class outline, collaborating with one of my industry partners, and of course, sewing! I take a break in the late afternoon to get in a daily workout with Jason, and then finish up any additional work in the evening before bed. I stop early enough so that I can get to bed at a decent time, and I usually indulge in an hour of “guilty-pleasure” TV watching each night (so I’m always on the lookout for a great Netflix recommendation!). I’m a planner! I design all of my quilts in EQ8 with the fabrics I’ll use before I ever take the first stitch. Often it takes longer to design them than to make them! My kids are older so they don’t need quite as much attention (my oldest lives on his own and is heading off to college soon, the next son graduates high school next spring, and the youngest, a freshman, is pretty independent although she’s still homeschooled). But because we have a flexible schedule, we can be there for them when they need us and still do all the regular parenting stuff. Plus they have all worked for us at one time or another, so that’s been a great family dynamic. These guys are our pride and joy: Jason, Jenna, and Ryan. We enjoy taking them out to lunch on a regular basis and love that they are adventurous eaters! One thing that I’ll confess right now is that I DON’T do much cooking or cleaning. The kids help a lot with cooking and we have weekly subscriptions to those healthy meal kit places (like Blue Apron, Freshly, etc.) which prevent us from resorting to fast food – or worse – salt filled frozen meals. About two years ago, we hired a cleaning service that comes in every other week to help us with basic housekeeping (in addition to the kids’ weekly chores). That’s the best investment we’ve ever made because I’d much rather hand bind a quilt than clean a toilet!! I’m very organized and I’m also a list-maker and schedule-keeper. I’m one of those people who really gets satisfaction from checking off an item in my to-do list, and I don’t mind rearranging my priorities on a daily basis if I can’t fit everything in. I’ve learned over the past few years to give myself more time than I think I need to complete a project, and I can’t stand being idle. So I’m always either planning, making, or thinking, and at times it can be hard to turn it off. I think one of the secrets to how I get so much done is that I make big goals, but then break huge tasks down into daily steps so that I can work on a monumental project a little bit each day. My personal philosophy is that I never think that anything is impossible – most things just take time, patience and perseverance to get them done. Book and pattern editing can be a tedious, lengthy process! So in an nutshell, that’s how I get things done. Often times, things that I want to do end up morphing into something else, and many ideas that I have don’t come to fruition. The key is to be flexible and roll with it rather than giving up and quitting. Any time I get in a rut or feel like I have creative block (which can happen) the most useful thing to do is look back at what I’ve accomplished, and give myself pep talks when needed. I hope if there’s something out there you really want to accomplish, you’ll set a goal for yourself and make it happen! I do a LOT of hand binding while flying across the country for teaching events. I snuggle up to a window seat, cuddle up with my quilt, and turn on headphones to shut out the world. Yes you CAN take needles and small scissors on an airplane with no problems!! Social media overwhelms me and I’ve decided it’s time to simplify. Don’t worry – the blog is NOT going anywhere!! But I’ve been contemplating over the last few months about how I spend my time and WHERE to spend my time. The result? I’m honestly getting a little burned out. I spend way more time on screens that could be better spent at the sewing machine! Because a blog post is more fun to read with pretty pictures, I’ve sprinkled in a few pics of my latest finish – HST Remix . I often have deep thoughts while quilting – it’s very therapeutic!! So here’s what I’m keeping: the blog, Instagram, and my Facebook group. What I’m NOT going to feel guilty about NOT doing: Twitter, YouTube, Instagram Stories, Facebook Live, Periscope, Snapchat, etc. What I AM going to enjoy: making and sharing what I want, when I want, where I want. If I make it – and others want it – they will find it. Dense machine quilting makes me happy. I’d rather spend more time creating, and less time managing social media. Since making that decision to simplify only yesterday, I woke up feeling much lighter today. I’ve realized I don’t need to post ALL THE THINGS to ALL THE PLACES, or worry about whether I cross promoted or over-promoted, or forgot to mention the latest and greatest: here, there and everywhere. I can simplify. I can make. I can share. And I can focus on quality over quantity which better aligns with my minimalist leanings. This is HST Remix, one of my QuiltCon entries. Whether it gets accepted to the show or not, I enjoyed every stitch of this huge 90″ x 90″ quilt! It was made entirely on my home sewing machine. If you are reading this from your mobile device, it’s a bit trickier to find the signup box. You’ll have to scroll way, way, down, like past a million blog posts until you get to all the “stuff” at the bottom of the screen. Then you’ll see the box to enter your email, or the Bloglovin button. But they are there if you persevere! Whew – that felt so good to get it off my chest!! I’ll post again when there’s something more to say or show. Now it’s time to start on the next quilt….